SELLER WILL ENTERTAIN OFFERS BTWN. 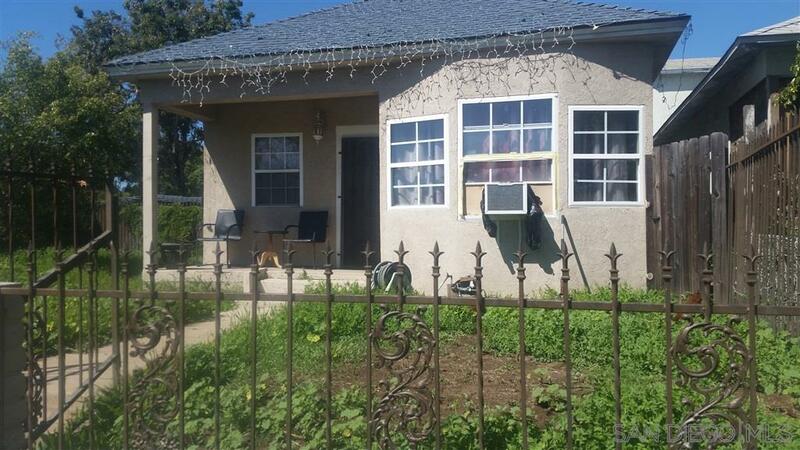 $369k-$395k!THIS IS A GREAT OPPORTUNITY TO INVEST IN AN UP AND COMING AREA OF SAN DIEGO MINUTES FROM DOWNTOWN SAN DIEGO! PER TAX ROLL PROPERTY IS A 3 BR. 1 BATH,1090 SQFT. BUT CURRENTLY A 3 BEDROOM, 2 FULL BATHS, 1,135 SQUARE FEET PER LAST APPRAISAL REPORT, CURRENTLY RENTED FOR $1,400 PER MONTH-TO A FAMILY FRIEND-VERY CLEAN & NEVER LATE ON RENT PAYMENT! HOME IS A LARGE LOT, NEWER WINDOWS, ROOF, AND STUCCO ALL AROUND. DON'T MISS THIS OPPORTUNITY!, BUYER IS ADVISED TO COMPLETE THEIR DUE DILIGENCE AND TO VERIFY ANY AND ALL INFORMATION ON THIS MLS SHEET INCLUDING BUT NOT LIMITED TO CONDITION OF THE PROPERTY, THE SIZE OF THE HOUSE, SQUARE FOOTAGE, BLDG. PERMITS, ZONING, ETC.